I’m facing a dilemma I’ve faced several times before. What to do about recipes? We don’t focus on churning out lots of start-to-finish recipes here on Foodists, mainly because it’s more about sharing food experiences rather than “just” recipes. But we do share our recipes, and try and tag the blog entries with ingredient hints to help find them. Still, it’s not ideal for sharing lots of recipes. Most of my cooking using recipes falls into the “inspired by”, “adapted from”, or “I’m sure it’ll be fine if I substitute half the ingredients” categories. But I’d like to keep track of those sources, whether it be from just the right Google search or from a physical cookbook. And yes, I’ve got lots of cookbooks. At the one end I’ve got basics like Joy of Cooking and Fannie Farmer, and at the other end I’ve got various cookbooks from second hand or thrift stores, plus a smattering of regional cuisines purchased while traveling. While I like nothing better to sit down with piles of cookbooks all around me, engrossed in reading and dreaming of food, it’s not very practical to a) easily find a recipe amongst dozens of cookbooks or b) to share that recipe. Where’s my digital index for my physical cookbooks?! I tried to solve my dilemma a while back by building my own recipe website. It does a passable job of sharing links to recipes I’ve found elsewhere, and a pretty terrible job at inputting recipes with full ingredients and instructions. And, I really don’t need to be maintaining yet-another-website. So over the holidays, I again began looking for a great place to make my “digital recipe home”. My first stop was at Foodista. It’s a startup out of Seattle that’s just barely a year old, run by a friend of a friend. Foodista is unique in being a kind of Wikipedia of cooking. You can set recipes to be public, which means that anyone can edit and evolve them, whether that means fixing mistakes, clarifying the directions, or adding a note that Brand X flour needs to be used differently. I love this feature, and I love the concept of seeing the history or changes of recipes over time. Foodista is still relatively new and will be evolving more features (check out my taste profile). I’ve already left a comment about making it easy to link in my own photos from Flickr. Next stop was our own local recipe / learning website, Rouxbe. I’ve got an account from ages ago, and couldn’t recall if they actually let you enter in your own recipes. They do, so I started work on entering in Shredded Short Ribs with BBQ sauce that I made over the holidays. At first, I was excited by the interface, which lets you upload a photo for each step. Ultimately, I gave up before completing and publishing the recipe, because there were too many fields and too much to fill out. So, Foodists, help me with my recipe dilemma: What recipe sites do you frequent? How do you share / keep track of recipes that you find online? What features do you want out of an ultimate recipe website? Evernote (evernote.com) changed the way I collect and use recipes. I couldn’t live without it. I sync my database with my ipod touch and use the ipod to follow the recipe when I cook. I don’t print recipes anymore. It’s amazing and it’s free! Thanks, Liz — that’s just the kind of feedback I was looking for. I’m hoping for something more structured — e.g. filter by ingredients and so on — but Evernote + iPod Touch in the kitchen does sound pretty awesome. It something akin to Github for recipes is what is needed. Ashamedly, I rarely keep/bookmark recipes anymore. I use either the Epicurious.com site or app using key words that depend on what I have available or am in the mood for, or I get inspired by one of the contributing food bloggers on TasteSpotting.com . If I want to use a recipe again, I search based on what I remember about the recipe. Lauren — I hear that story all the time. For the “mass market” folks, they tend to search Google and look for the “purple link” that is 4th from the top. I’m a tad more obsessive, so I want to look back, as well as sharing (as well as being structured, so “just” blog posts are out). I went “make your own recipe website” route. Evernote over here too, on all my desktops and iphone. For recipes and just about everything else. I’ve been having the same dilemma. 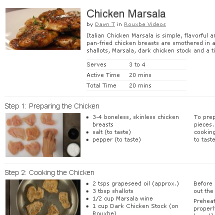 For now I have my recipes scattered all over – some bookmarked in Delicious, some written up in Google Docs. I tried using SousChef on my Mac for a bit. It’s an awesome program, but I want my recipes online so I can access them anywhere, share them, etc. And yes, I’ve considered building my own site too ;) Nothing out there seems to be quite right. Lisa — I signed up for Culinary Culture. Wow, the recipe add form is EVEN LONGER / more confusing than Rouxbe. I tried SousChef — I have a list of bugs / UI thingies as feedback for them, and yeah, not built as web-centric at all. They do have their “Recipe Cloud” — but they really should make all of those web accessible, too. Great post. Can certainly understand the challenge. Yes… the find folks at foodists and I have been in discussions around addressing this need, but priorities on our end (Rouxbe) keep pushing the exercise out – now into 2010. However, we will solve it. Perhaps with foodists and those on this thread. We have a vision at Rouxbe to create a recipe app that not only organizes and presents the data (recipe), but more importantly, an app that automatically aligns all the related technique videos, cooking school lessons and even provides access to a photo gallery of over 10,000 food images we have at Rouxbe. Technique instruction is a key missing ingredient with any recipe, unless you’re a highly qualified home / pro cook. Who wants to build it with us? Any rails developers on hand. Should be fun. Skeleton architecture is in place although I agree with Boris.. it needs some work. Should note though that every text recipe and every video recipe on Rouxbe was entered using this exact UGC app in the test kitchen. My solution was similar to your initial – build my own. My partner wants a repository for recipes that she tries out and wants to be able to find again. I of course have opened it up a bit so others can add their favourite items. http://recipes.virishi.net if you want to see it as an infant… and please feel free to upload a few recipes that you would like to share. Joe — it’s great news that you’re thinking about an API. I actually think you should play to your strengths, which is training & video. Having other sites extend their recipes with Rouxbe instructions & videos would be amazing. Scott — looks like Another Fine Drupal Site (AFDS) :P Works, but the plain text fields for recipes means I may as well just blog my recipes. This doesn’t address Boris’s original issues, and I suspect once we do this will be unnecessary: I received all sorts of recipes via email. Rather than type them out again, I print a PDF or make a Word doc and name it something descriptive. Then I put it on dropbox. This give me alphabetical access to these recipes on my iPhone using the dropbox app. Not a total solution, but a good quick way to lazily keep and access recipes you get online. I have Evernote too, but never really dug into it. I suspect it might be an even better way of doing this so will check it out. And yes Joe, it’s time! Great post on a current topic that is on the mind of many foodies! It’s an interesting time for home cooks; even though there is an enormous amount of online recipes for free, we still want our tried and true printed cookbooks. Even though I am an avid cookbook collector, I have to admit when I’m looking for a recipe or need a quick answer to a cooking question, I always go online first. In this interesting time of wanting both digital and printed recipes, what is the perfect solution to keeping favorite recipes organized and accessible online in one place? Like you mentioned earlier, Foodista is just barely a year old and we have only begun to scratch the surface of recipe sharing and storage on our site. One thing I know is time is precious and if you make a recipe storage site too difficult or time consuming to use, you lose people fast. Also, we are listening to our users and incorporating feedback. As a collaborative site, we hope to only get better for the benefit of everyone. Oh, and something else I’ve been wanting to do (though might just do it electronically on dropbox or evernote mentioned in previous comments, a recipe cheat sheet! This is simply a single sheet with the six to 12 recipes you always use kept, where else, but in the kitchen. Think pancakes, cookies, bread, etc. Here’s an example. Hello! I found this blog in Foodista and followed it here. Thanks for mentioning Foodista in your blog. By the way you can place more Foodista widget in your past and future blogs so that other Foodista readers can follow and see your blog too. Just search for a related recipe or food in Foodista and use its widget. I hope to read more from you. Cheers!